Once again, Apple and Google are vying for your money and the honor of introducing you to the future. This time, instead of your phone, they present you with tablet computers. Using a touch screen, you no longer have to lug a laptop around. You simply have the flexibility of an on-screen keyboard or handwriting recognition software. But even before you decide which model you want to buy, you have to decide what OS you want to run. 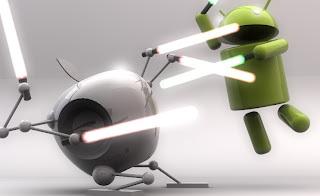 Much like choosing between Windows and OSX, you need to decide whether you want Android or iOS. Both have their good points and bad points, while still catering to people’s preferences. Most tablets vary in price depending on the storage capacities so even if you look at devices from one brand, it can range from $300 to almost double that amount. Tablets typically have a wide range of capabilities such as cellular phone functions or expandable storage through memory card slots on top of its storage capacity. But no matter how you look at it, Android is available in entry-level tablets that cost a fraction of the cheapest iPad’s price, including the new Mini. As with any device from Apple, their iOS is very definite about what you can or cannot change. Basically, you can only mess around with your wallpaper, your screensaver, and the case of the tablet, if you even have any. This is not to say that the display isn’t pretty; it just can’t be changed much. An Android tablet, on the other hand, can be tweaked so many ways. You can download custom themes and animated wallpapers or screensavers. You can install new fonts, change the way the screen changes, and even modify alert sounds or how the notifications are presented. The App store on iTunes still boasts more apps than the Google Play store, but most popular apps like RingCentral are available for each OS. When you get to games, though, you may find more numbers for the iPad than any other tablet. What’s more, all iPads can run the apps in the store while the flexibility of Android as an OS sometimes constrains the user. Apple’s Retina display and touch screen experience still wins over any Samsung tablet so far. You can get storage for Samsung tablets or similar devices much cheaper compared to the constraints of an iPad’s set storage. You can just buy a micro SD card for your Kindle Fire or Samsung tab, which is much cheaper than the usual $60-$100 upgrade from a 16 gigabyte iOS device to a 32 gigabyte model.